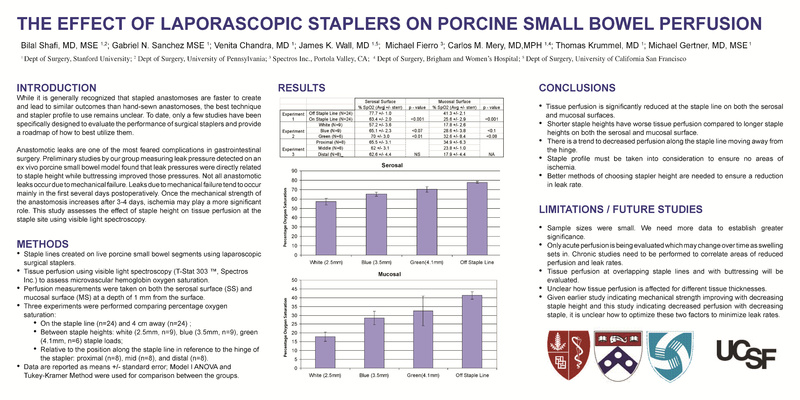 The Effect of Laparoscopic Staplers on Porcine Small Bowel Perfusion. Introduction: Few studies have been designed to assess the performance of laparoscopic surgical staplers. This study analyzes the effect of staples and staple height on tissue perfusion. Methods: Staple lines created on live porcine small bowel segments using laparoscopic surgical staplers were tested for perfusion using visible light spectroscopy to assess tissue oxygenation. Perfusion measurements were taken on both the serosal surface (SS) and mucosal surface (MS) of the staple lines and are reported as percentage of oxygen saturation. Three separate experiments were performed comparing: (1) measurements at the staple line (n=24) and 4cm away (n=24) ; (2) staple height: white (2.5mm, n=9), blue (3.5mm, n=9), green (4.1mm, n=6) staple loads; and (3) position along the staple line in reference to the hinge of the stapler: proximal (n=8), mid (n=8), and distal (n=8). Data are reported as means; parametric tests were used for analysis.